This general lack of hygiene for many of the children meant that illness and vermin were rife. The bathing centre at Floodgate Street School was used by the surrounding schools too, and the Hygiene sub-committee of the School Board often had to deal with issues surrounding it. It was discovered a few days later that the child had Diphtheria, a disease which Tinkers Farm School, at least, recorded inoculating for in 1938. Small Pox vaccination attempts caused some controversy in 1874. GP B/29/1/1. 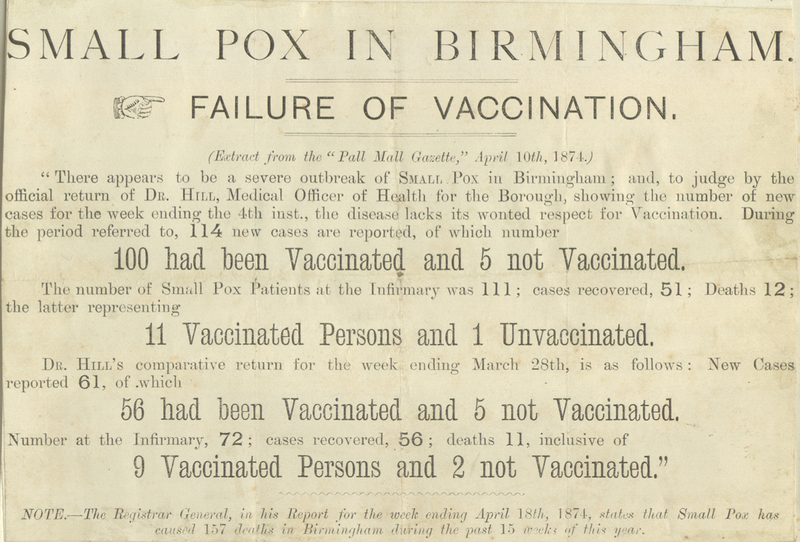 Yet vaccination for Small Pox originally met with opposition, as recorded by the Birmingham Poor Law Union Vaccination Committee minutes of 1874-5. This sentiment had evidently changed enough by 1938 for the Birmingham School Board to inoculate for Diphtheria. This entry was posted in News and tagged archives, birmingham, childhood, children, disease, education, floodgate street board school, heritage, illness, school, tinkers farm road school, vaccination. Bookmark the permalink.